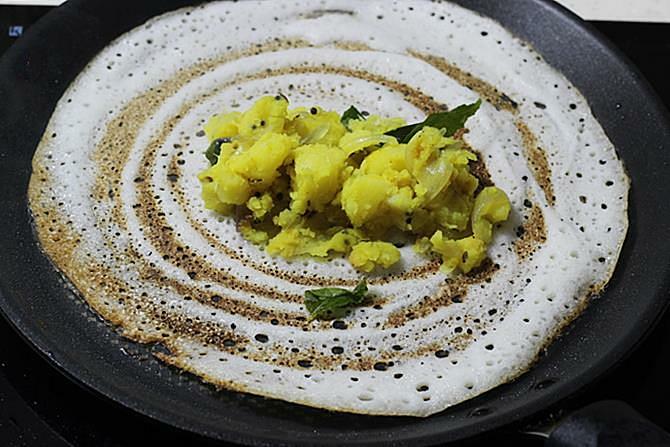 Dosa recipe, Learn how to make dosa batter at home. This is a detailed post that will guide you to make dosas of all kinds – soft, crispy, restaurant style, home style and healthy dosas. 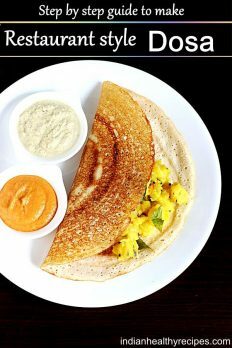 No matter you are a beginner or an experienced cook the tips & tricks mentioned in this post will help you to master the techniques of making the best South Indian dosa. 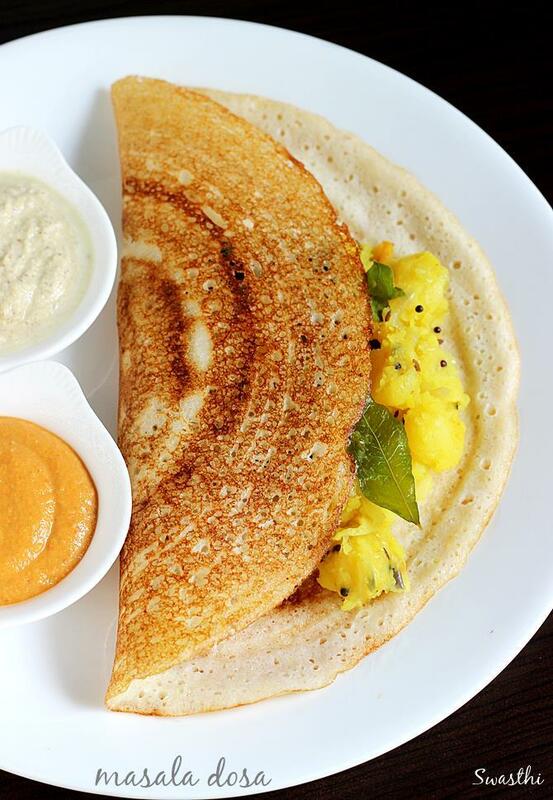 Dosa is a popular South Indian thin crepe that is made of fermented rice and lentil batter. History of dosa says that they were made using only rice but with the passage of time, people started to add urad dal / black lentils to give texture and taste. Dosas became very popular with the rise of udupi restaurants which serve the best dosa varieties – plain, set and masala dosa. How can I make dosa at home? Dosa is made by soaking and blending black gram lentils (urad dal) and rice to a batter. Then the fermented batter is spreaded like a crepe on a hot griddle or tawa. Yes Dosa is a healthy protein rich breakfast. Urad dal is high in protein & calcium and makes a great food to start our day. I consider it to be one of the best health foods that can nourish our body so I try to keep the ratio of urad dal more & rice to minimum or only as needed without compromising the taste and crispness. Idli and dosas are made regularly at my home for breakfast and sometimes even for dinner. There are so many kinds of dosas one get to find on a tiffin or a fast food center menu. Dosas can be made with so many different ratios of rice and urad dal. 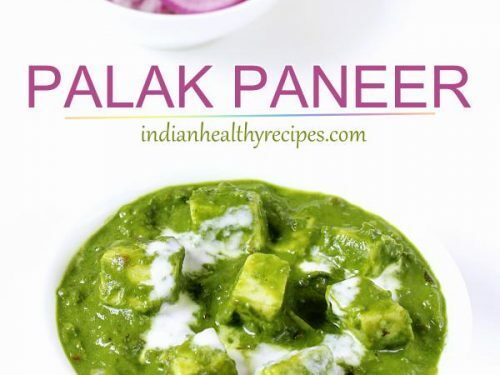 I am sharing 4 recipes here on this post which I follow. 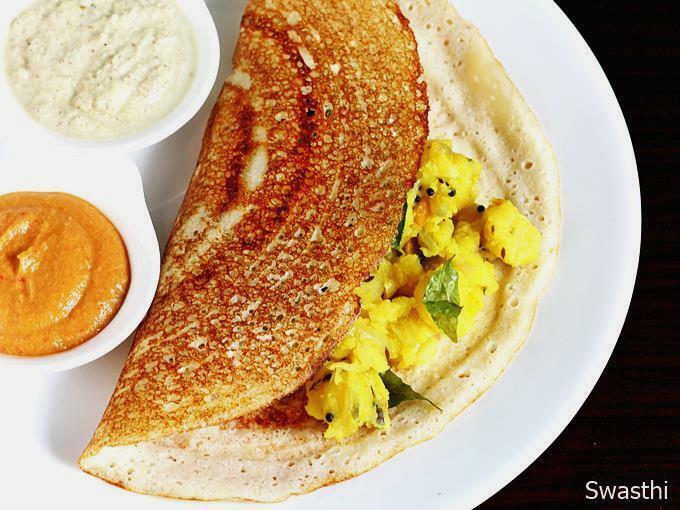 You may experiment with any of these dosa recipes to suit your taste or need. Mixer or a wet grinder – which is better? I do not use a wet grinder though I have one since I personally do not prefer the cleaning and lifting the stone works. Years ago We used to have frequent guests home from India, So we used to make batter once in a week. It is a good deal to have and use a wet grinder if you have many people at home to eat idli dosa frequently. For the past 3 years I am happy with my mixer grinder though we are a family of 4 and make dosas at least 3 times a week. The batter rises very well even when ground in the mixer if it is a good one and doesn’t make your batter warm while grinding. However I have shared making batter in a wet grinder and also in a mixer. All the ratios shared in dosa recipe post will work even if making batter in a wet grinder. 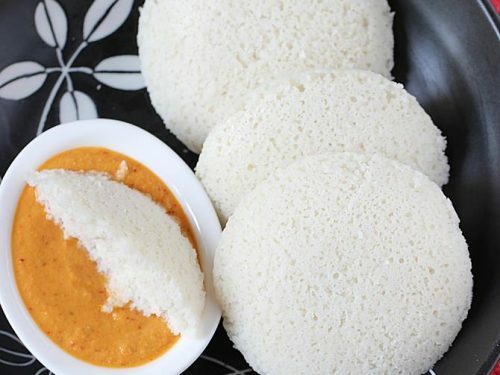 Which kind of rice is suitable for dosa? There are many kinds of rice available in the market. All the recipes posted here have been tried with raw rice, idli rice and parboiled rice. But you will get the best results with raw rice. The results with parboiled rice are not the same always. It depends mostly on the weather conditions. Please note that all parboiled rice are not suitable, only short grain like ponni or sona masuri etc are suitable. When to add salt to dosa batter? while grinding, before fermenting or after fermenting is one of the most common question. 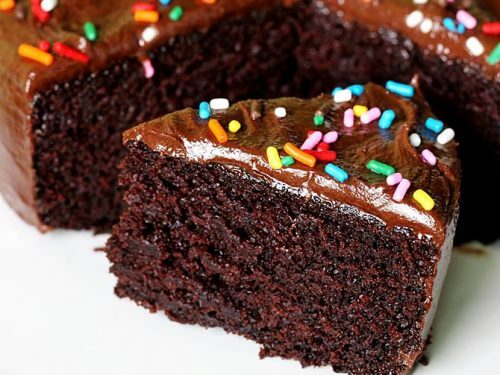 This you will have to experiment and check what works good for you since this depends on the climatic conditions and the water used to blend the batter. 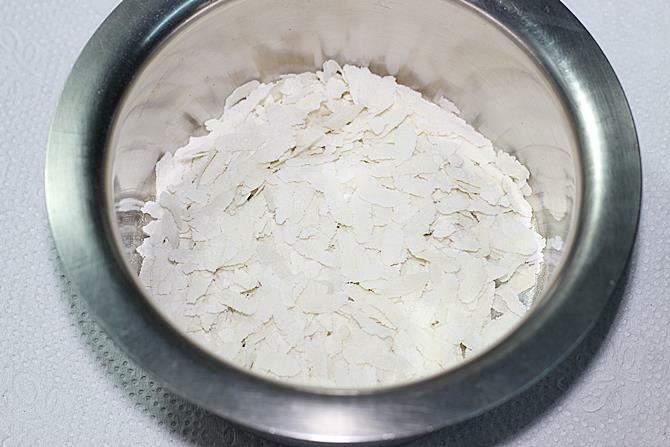 In cool places or cold countries, batter takes long hours to ferment without the addition of non-iodized salt. When kept for long hours the batter may turn smelly. So to avoid the smell it is good to add sea salt before fermentation as it assists in quick fermentation. But in hot places and hot season, it is good to add salt just before making the dosas i.e after fermentation else the batter turns sour and smelly. In India most people add salt after fermentation unless living in cool places like Bangalore. Taste wise yes there is a difference in adding before and after. So please experiment what works good for you. This recipe yields one of the best tasting brown & crispy dosa. 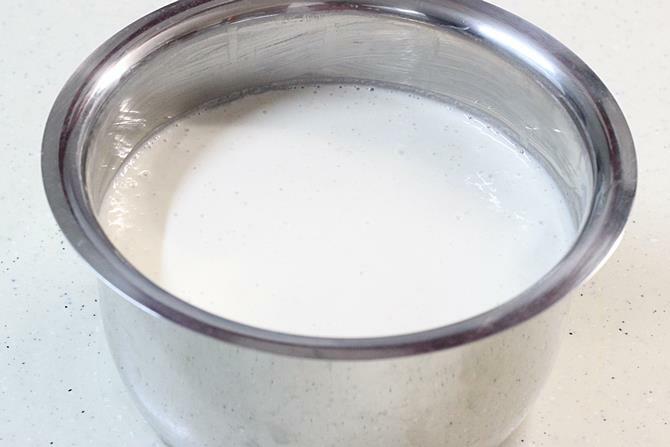 This batter can be used to make masala dosa, crispy plain dosas, uttapam, masala paniyaram and sweet paniyaram. I follow this recipe the most for my regular breakfast. The masala dosa shown in the first pic is made using this recipe. 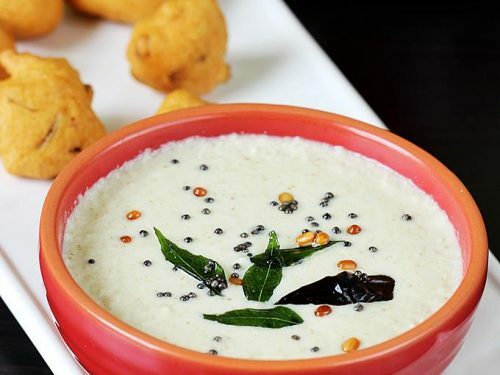 It can be enjoyed with any Chutney, potato masala or Tiffin sambar. Typically most proportions yield red to brown color dosa only when made on cast iron tawa, but this dosa recipe yields brown crispy dosas even when made on non stick. You can find the step by step pictures below along with the link to potato curry recipe and the detailed recipe in the recipe card. If you have ever wondered how dosas made in restaurant or tiffin centers turn out so flavorful, crisp and delicious, then you will have to put in little more effort and try this karnataka restaurant style masala dosa. These are very aromatic and unique. These ratios yield good crispy as well as soft dosas and can be used to make soft idlis as well. Just mixing the batter matters. A runny batter yields soft dosas. Making with moderately thick batter, but of spreadable consistency yield crispy dosas. This can also be used to make masala dosa, paniyaram, uttapam and also soft idli. The only difference from the first recipe is the color. These do not turn as red or brown like the other one but will be golden. If you like to make your idli and dosa batter in one go in the same blender or wet grinder, then this may be for you. – can also use the batter for idli if the quality of dal is very good. Healthy, high protein and high calcium dosa. These are made in some telugu speaking homes. Great food for all, including folks recovering from illness, kids and babies above 9 months and even for under nourished. I make this sometimes when the hubby asks for it since he loves the flavor. These have a unique flavor & taste of urad dal. If you like it, you may not look for any other recipe. They must be served right out of the pan as they turn lightly crisp, not as crisp as the other recipes I have shared in this post. I highly recommend this, If you have babies & kids at home (especially underweight kids). Also good for those looking for high calcium foods and even for breastfeeding mothers. 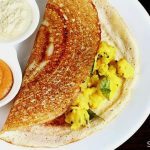 Dosa recipe – South Indian Lentil crepes made with fermented dosa batter. 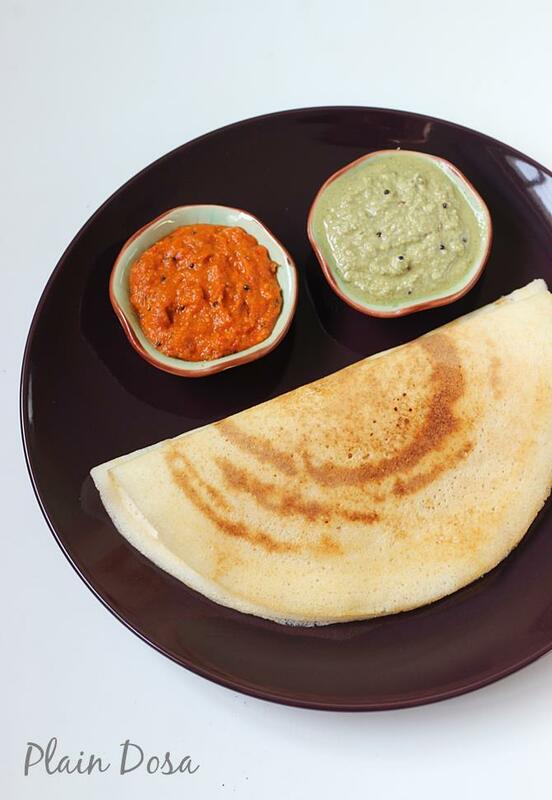 These are known as dosa or dosai and are a popular breakfast food. These are served with chutney, potato masala and sambar. Firstly add urad dal, chana dal & methi seeds to a large bowl. Rinse them very well several times and discard the water. Soak them together in enough fresh water for 4 hours. Next add rice to another bowl and wash a few times. Pour fresh water and soak separately in ample water for 4 hours. Lastly wash and soak poha just 30 mins before grinding the dosa batter. Drain the water from the dals, methi and poha. Add them to a blender jar along with salt. You can also skip salt at this stage if you live in a hot region. Add it to the batter just before you make dosas. Pour water just as needed. Grind to a smooth paste until smooth & bubbly or frothy. 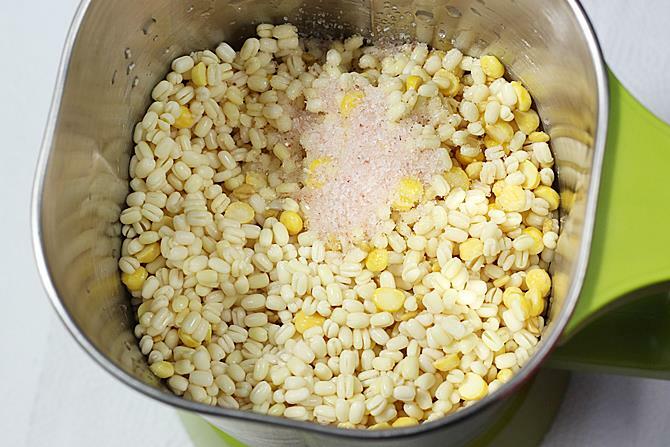 Transfer this to a large pot if using a mixer. If using a wet grinder, you can just keep the urad dal batter in the container if making in small quantity as much mentioned in the recipe. Drain the water from rice & add it to the jar and then pour very little water. Blend to a thick paste. Add this to the urad dal batter and mix well. Check the consistency of the dosa batter. 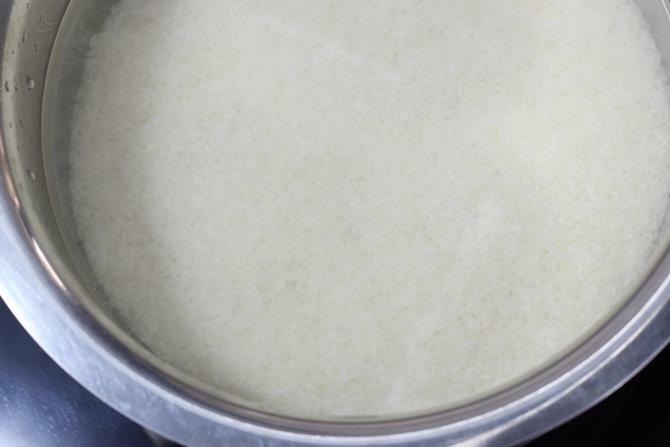 It must not be very thick or very thin otherwise the dosa batter will not ferment well. Check the salt as well and adjust. 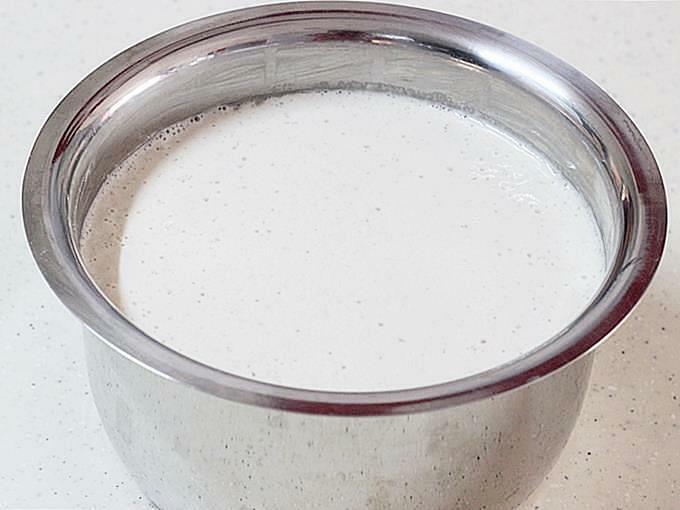 Cover the dosa batter and keep this in a warm place until fermented. It may take anywhere from 5 to 16 hours depending on the temperature. Next morning gently stir the dosa batter once. Add water enough to thin it down to make it of a pouring consistency yet thick. If making masala dosa, you will have to make potato masala from the link mentioned in step by step photos (step 15). Grease a dosa pan or tawa with few drops of oil. If using a iron tawa, grease tawa with oil and a slice of onion. This prevents the dosas from sticking to the pan. Heat it until hot enough. Pour a ladle full of dosa batter on the center of the tawa. Spread it evenly in a circular shape to get a dosa. Drizzle oil and allow to cook on a medium high heat until red or golden. Flip the dosa when the edges begin to rise from the pan. Cook on both the sides of the dosa if you desire. Repeat making more dosas on the hot tawa. You can also rub with the cut onion and the pour the batter. Serve dosa with chutney and potato masala. You can use 1½ cups regular rice like sona masuri or ponni. You can also use 1 cup regular rice and ½ cup parboiled rice or idly rice. You can also use ¾ cup raw rice and ¾ cup parboiled rice or idly rice. Experiment with the above proportions and find what works for you the best in terms of taste and texture. You can skip either poha or methi seeds in the recipe. Use at least one of them. During summer you can skip both methi seeds and poha if you live in a hot climate. 1. 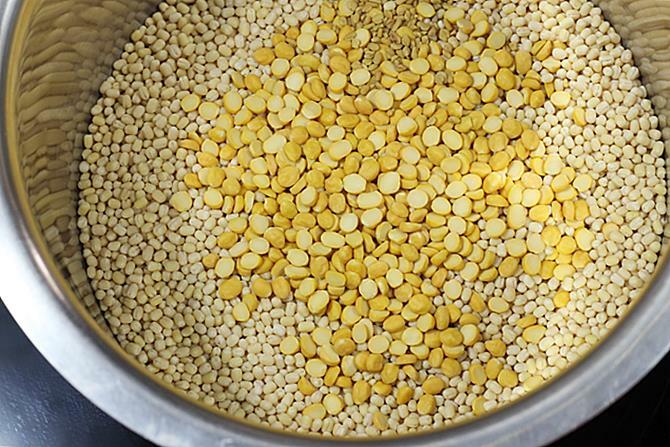 Add dal, chana dal and methi to a large pot. 2. Add rice to another pot. 3. Wash dals thoroughly a few times and soak in ample water for 4 hours. During cold weather they can be soaked up to 6 hours. 4. 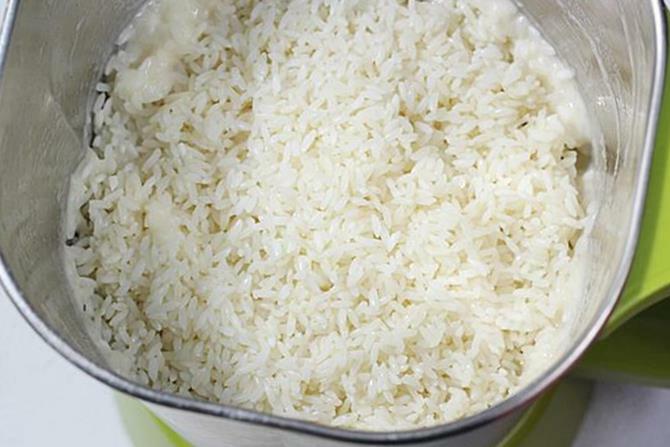 Wash rice too a few times until the water runs clear. Soak in enough water for 4 hours. 5. Wash and soak poha for 30 mins before grinding. 6. Add poha to the grinder jar or container. Drain the water completely from dals and add them along with salt and little water. You can also try skipping salt during summer, add it the next morning when you are about to make dosas. It will still ferment well without salt. I use salt when I grind the dal otherwise my batter doesn’t ferment well. Using dal soaked water turns my batter very sour, so i do not use. 7. Blend until smooth, frothy and bubbly. If needed add more water. But do not make it thin it must be a thick batter. If making in a mixer like me, then transfer this to a large pot. If using a wet grinder, you can just keep it in the container and continue. 8. Drain rice and add to the jar. Add just little water. 9. Blend to a smooth paste. 10. Add the ground rice and mix well. 11. Cover the pot and ferment it for 5 to 16 hours depending on the climate. During hot summers it may rise in just 4 to 5 hours during winters it may need up to 16 hours. When I grind more batter, I use 2 ceramic pots to ferment and refrigerate. I divide and distribute the batter to 2 pots. 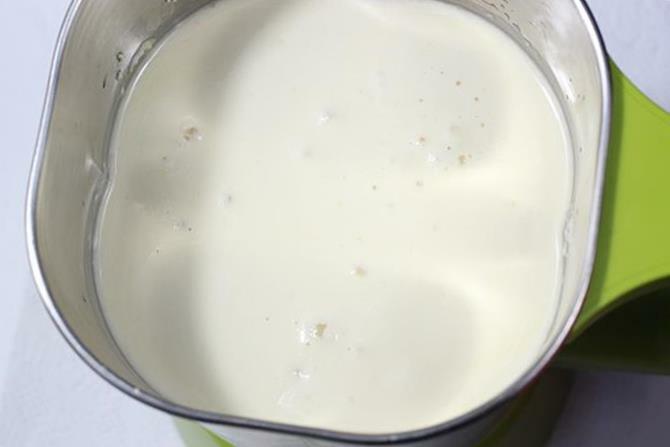 Undisturbed batter stays good in refrigerator for few more days without going sour. 12. When i made this, I had to ferment for 16 hours. Singapore is hot most times, but still it takes very long to ferment the batter in my home. 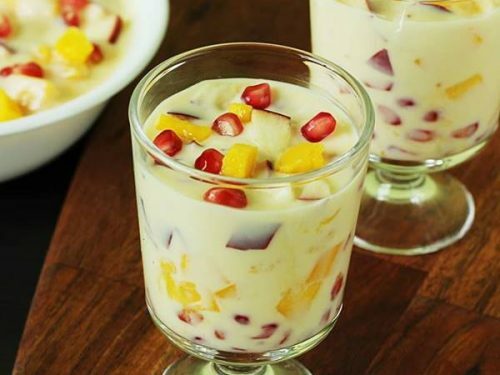 During summers do not allow to ferment too much as it leaves a sour smell & taste. You can refrigerate when it rises a bit. For a good fermentation 4 things matter the most – quality of dal, non iodized salt, temperature and the consistency of the batter. You can find the details of these on the soft idli post which i shared before. 13. Add few drops of oil to a tawa / pan. Rub well with a kitchen tissue or cloth until the oil is absorbed. Make sure there is no excess oil on the pan. You can also use a slice of onion to rub the oil. If using a cast iron or a iron tawa then you will have to season it the previous night for best results. 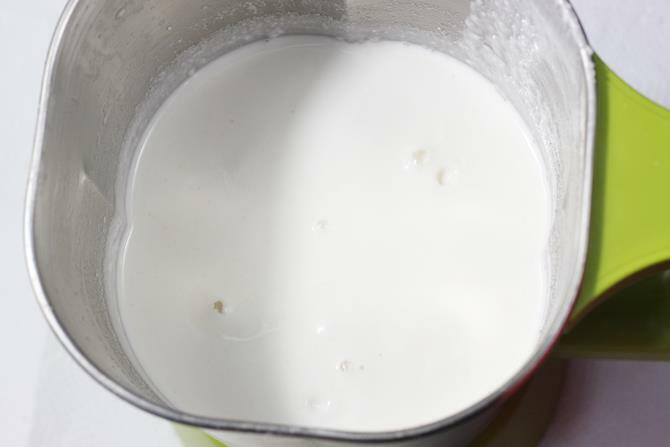 Dilute the batter by adding little water as needed to make it of a pourable and spreading consistency. You can sprinkle few drops of water and check if it is ready. It begins to sizzle. Do not sprinkle water often on a hot non stick tawa that’s going to wear out even the best non stick coating. When the pan is hot enough, pour a ladle full of batter in the center of the pan. 14. 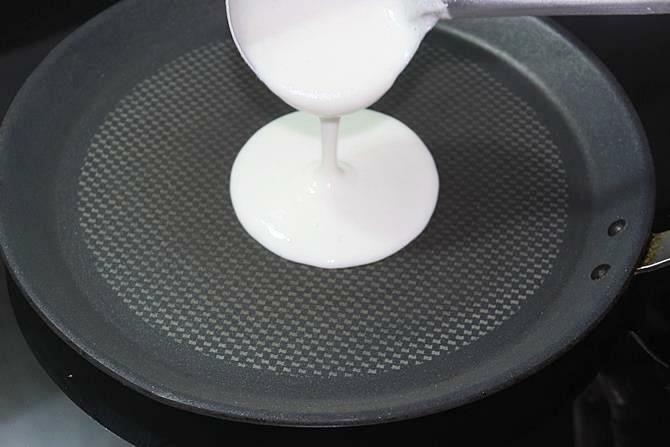 Spread it evenly in a circular way to make a thin crepe. Add oil or butter towards the edges. 15. When it turns golden or brown , flip it and cook if you like. Not all dosas require cooking on the other side, if needed you can cook. Since i made the masala dosa, i used this potato masala for filling. It is most commonly served with coconut chutney. Thanks for your detailed recipe. Since I started making dosa batter in the wet grinder, my dosa doesn’t turn crispy. I was interested in your recipe 3 where you said 1 & 1/2 cups rice for mixer and 2 cups for wet grinder, just wondering why this difference in quantity? Thanks. Wet grinder makes the dal more light, fluffy & airy when compared to the blender or mixer grinder. The quantity of dal batter will also be more in wet grinder. So the texture of dosa will be not be crispy and may have a prominent taste of dal. 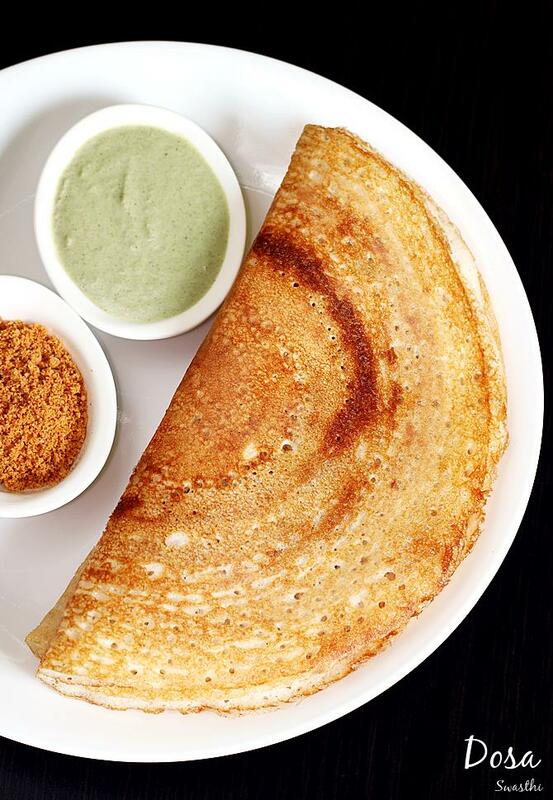 To balance that we use more rice which makes the dosas crisp. You need to experiment and check what works good for you. I also know a lot of people using 1:5 ratios of dal:rice along with some methi seeds or poha. This was the first time in months I got the Dosa recipe right and the Dosa turned out GREAT. Thank you so much. I didn’t know what I was doing wrong But this time followed your recipe (recipe 2) exactly except that I soaked dal and rice and methi seeds together as I didn’t read the post accurately . Nevertheless, it turned out fine. You are welcome. For years Dosa has been an everyday affair at home but still half of the times they don’t turn out good. I feel it is the rice & climate that impacts the texture,color & taste of the dosa a lot. Just check if any of these 2 is the reason. Thanks for the comment. Climate is certainly a factor. I live in a cold country and have learnt to use the oven for fermentation in the cold months . The two changes I noticed between my previous recipes/process and this one is (1) ratio of rice is 1.5 vs my previous ratio of 1 cup (2) soaking for 4 hours as per your recipe (previously I would soak overnight). Thanks again! I aman ex Malaysian/Singaporean now residing in Australia (last 30+ years). Born and brought up in Malaysia, I grew to love dosa, sambhar and vadas which were readily available. While we do get dosas in restaurants here and dosa batter is also available, but I still prefer to soak and grind the ingredients and find it’s worth the labour making them that way. Thank you for the recipes and the hints. I read that if it is difficult to get in a home the right temperature for fermentation, one can use and immersion circulator at 110 deg. F. I use mine to make yogurt as well. Thanks for trying and sharing the info on immersion circulator. I never knew it can be used for fermenting dosa batter. Thanks for the quick reply . I used idli rice . I will try out with sona masuri. Thanks again. She is a good incredible author. They are nothing that chef who does not follow her recipe. Dear chef i am following your all recipe . Dear thank you for your all word from my heart. Thank you so much for following my blog. Very happy to know you like it. Hi Swati. Thank you so much for your dosa recipes. I have tried all of them and they all turned out delicious! Thanks for trying the recipes. Glad to know they came out good. You can use 1:3 ratio (dal:rice). I have not tried with cooked rice as it is not healthy to ferment already cooked rice. Hi swasthi, all these days dosa turned out well. But today dosa became hard and I feel like having raw aata. Either dal or rice has blended some coarsely. Dosa is not turning golden or brown color. I didn’t use chana dhal and poha. With ur experience share some tips…. I guess it is the quality of rice or not blending the dal well. There is nothing you can do to fix it. If the dosa is white in color I feel it happens if the rice is from fresh harvest, just a few months old. Just change the rice and check. Nice recipe I like it .. I have been making dosas from here since a few months experimenting to get crisp and dense dosas. Any rice works only when used with chana dal and poha. But over fermenting ruins the dosa making more pores and very thin and light. Thank you very much for your ideas and thoughts. This post really helped. I don’t have a mixer and for obvious that easons am not keen on wet grinding…………would commercial rice and urid flours work? I live in Australia. Also, what is ‘poha’. Do you have a botanical name? 1. The batter is thick and needs little more water. 2. The pan is not hot enough. 3. The batter has rised a lot and is very light. This can happen during hot weather. To fix this, sprinkle little water and just beat the batter a bit with the ladle. This will reduce the bubbles in batter and fix the problem. 4. Using raw rice that has recently been harvested can also be the reason. Aged rice is best for dosa. 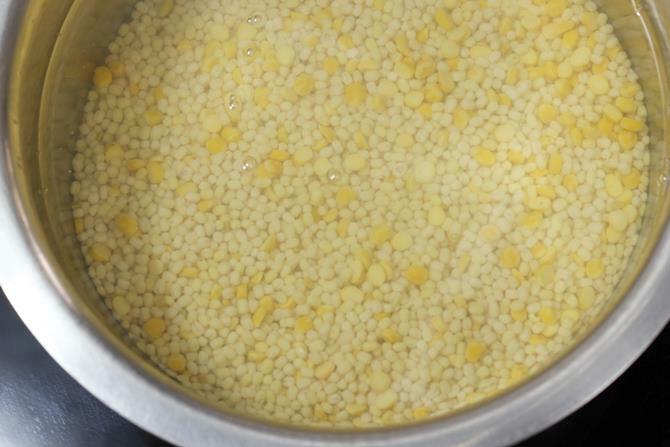 You can soak 1 to 2 tbsp of millets along with the dal for good fermentation in cold places. Hi swasthi I have been making these dosas for over a year now. They turn out great. Can you please share noodles stuffed dosas? My kids love them a lot. Swasthi I tried this dosa recipe. 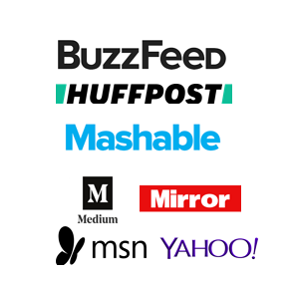 Kudos for your useful tips!! 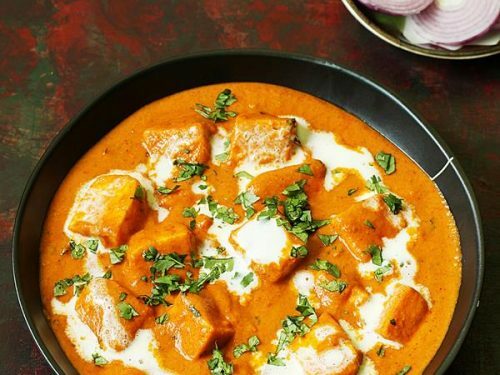 They turned out great with your potato masala. For how Long can the batter be refrigerated? Thanks for trying. You can keep the batter for up to a week if you partially ferment it. If the batter has doubled after fermenting then it is good to use it up in the next 3 days. Thank u for making my day…dosaz turned out so yummm. My lil toddler just couldn’t get enuf n for the 1st time my dosaz wr nt a disaster.